The price differences are dramatic -- a 2 Mbps link between London and Johannesburg costs roughly the same as a 10 Gbps link between London and New York. A recent New York Times article points out that the cost of serving Web content over slow, unreliable links in developing nations is high and the income from advertising is low. This has led some companies to block developing nations from their sites or to offer degraded content by, for example, compressing video or serving "light" versions of pages. 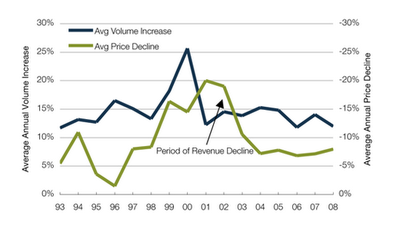 What are some of the causes of high international link prices in developing nations? What other factors contribute to the Internet being relatively slow and expensive in developing nations? We have discussed three generations of cellular technology, and the fourth is beginning to take shape. It took nearly six years for 3G cellular to reach 100 million subscribers world wide, but market research firm Pyramid Research estimates that 4G Long Term Evolution (LTE) technology will grow faster. They expect a compound annual growth rate of 404% from 2010 to 2014, with 136 million subscribers by year-end 2014. 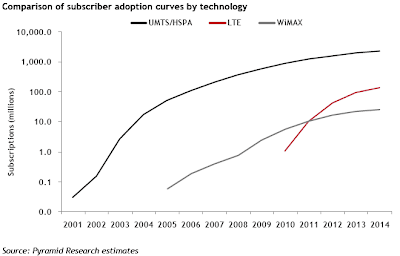 Note that Pyramid Research expects LTE to rapidly surpass mobile WiMAX. At 100 Mbps, LTE will not be limited to cell phone service, but will be used for fixed, portable and mobile Internet access. If you live in a large city in a developed nation, you might look forward to LTE or Mobile WiMAX by 2011. Others will have to wait. (Some for a very long time). Is 3G cellular currently available throughout the city you live in? Throughout developing nations? What applications and mobile devices do you foresee for 100 Mbps mobile connectivity? What changes may occur in the cellular companies business and billing models? Substituing communication for transportation -- can we reduce business travel? My son-in-law Mark flew from Los Angeles to Seattle last Thursday for a job interview. The round trip air fare plus four cab rides cost $619. He had a long day, getting up at 4 AM to catch an early flight, and was not home until early evening. If he had stayed over in Seattle, the a hotel room and meals would have brought the cost close to $1,000. Three people interviewed Mark, and he feels that a teleconference would have been as effective as flying up for face-to-face interviews. Ten years ago, I conducted a study of business travel at Hyundai, USA. Nineteen employees monitored their travel for three weeks, identifying trips which could have been avoided if various communication alternatives had been available. Based upon that data, we estimated savings of 3.6 hours and $298.07 per employee per week. In the ensuing ten years, the cost of travel has risen somewhat and the cost of communication has dropped dramatically. Why did they fly Mark to Seattle rather than conduct a teleconference? The standard answer is that information is lost in a teleconference -- you don't get the same feelings and subtle clues as when you meet someone face-to-face. If you have any doubt that a teleconference can convey emotion, watch this excerpt from A Hole is Space, showing clips from a two-way video link between people in New York and Los Angeles in 1980. A Hole in Space was not a business installation, but performance art anticipating today's emerging high-speed connectivity. A high bandwidth teleconference can convey emotion, but that is not widely accepted in our culture -- yet. But, my grandson has grown up making Skype video calls to his relatives in Chile. By the time he starts high school, he will be video chatting on his mobile Internet-access device. Will a teleconference seem emotionless or unusual to him when he joins the workforce? Have you done video chats or conferences? If so, was it as effective as talking face-to-face? Would the experience have improved if you had a very powerful computer and very fast connection to the Internet? What are the economic and environmental implications of substituting communication for transportation? International VoIP is growing fast -- what are the implications? As a result of globalization, we are making more international phone calls every year. 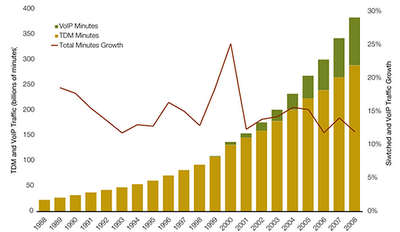 In 2008, we made 384 billion minutes of cross-border calls -- 12% more than 2007. This graph shows the annual growth rate and the total number of call minutes for both traditional time-division multiplexing (TDM) and voice over IP (VoIP) calls. Both are growing, but VoIP is growing faster. For example, traffic on Skype, the leading international VoIP provider, increased by 41% in 2008. Skype carried 33 billion minutes in 2008, accounting for 8% of international voice traffic. This sounds like good news for the industry, but, as we see below, prices are falling as traffic increases, keeping revenue roughly flat. (This data was from Telegeography, a leading telephony and Internet market research firm and our class notes on VoIP are here). Do you make international calls? How does the cost per minute using Skype or other VoIP services compare to TDM calls? Do the traditional phone companies make any money on VoIP calls? What will happen to telephone companies if VoIP continues to outgrow TDM? How will this trend effect developing nations? Here is a short excerpt from a talk by Zappos.com CEO Tony Hsieh, in which he discusses their customer service. Customer service excellence is a core value at Zappos. They publish their 24/7 toll-free phone number on every Web page. Customer service representatives are expected to give friendly, helpful “above and beyond” service, and Zappos does not time calls or set sales-based performance goals. They view a call as a branding opportunity rather than a necessary expense. Reps even direct customers to other Web sites when appropriate. Zappos also gives free shipping and return shipping, accepts returns for a year, stocks every item in their own 24/7 warehouse, and often surprises customers with an upgrade to overnight shipping. (Hsieh's full talk, in which he stresses culture building more than customer service, is here). Just a quick email from Team Flickr to let you know that we've successfully received your recent Help by Email query and we hope to respond shortly. We'd also like to take an opportunity to remind you that one query is sufficient and multiple queries regarding the same issue make the Magic Donkey cry. Lastly, you may not be aware that our FAQs and forums are full of help goodness. They tried to blow me off to their FAQs, warned me not to resend my query, and irritated me with their cutesy language, but, that would be OK if they helped me with the problem. The next day, I received an email saying they had escalated the question to a "senior representative." But, evidently the senior representative had a five week backlog. On April 24 he got back to me with a non sequitur, boilerplate-laden answer. Customer service clearly costs Zappos more than it does Flickr, and they are targeting a high-end retail customer, but, no matter what the purpose of your Web site is, you should study Zappos' example and do a lot better than Flickr. Have you seen other examples of very good or very poor customer service on the Web?